Celebrate your commitment to fitness or focus on your goals for the coming year with a personalized fitness ornament you and other recipients will enjoy. 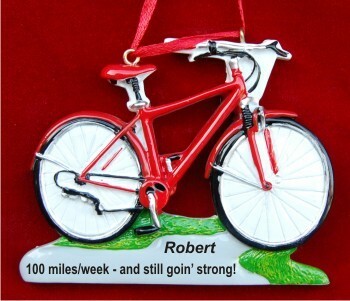 The bike for health red fitness ornament personalized by Russell Rhodes includes the details you share with us. They are lettered on by hand in a stylish font to create a personalized bicycle ornament like none other. This red bike ornament is one of many fitness ornaments in a wide range of activities like biking, jogging, swimming and many sports too. It is a great fitness gift idea for the biking friends you hit the road or trail with. Enter up to 42 characters.